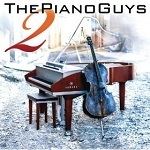 The Piano Guys just released their second CD, named simply The Piano Guys 2, on the Sony label; the first one (reviewed here) was The Piano Guys. No mystery there. In case anyone’s wondering, the other three guys are arranger/percussionist Al van der Beek and videographers Tel Stewart and Paul Andersen. Regardless of what they’re called, they’ve successfully bridged the gap between classical and cool with inventive arrangements featuring new age sounds and sound effects, interesting nuances and textures, and abundant surprises. For example, their premier album’s “Over the Rainbow/Simple Gifts” is a cheery fusion of traditional and modern. Echoes of Star Wars are heard in “Cello Wars,” and snatches of the Fifth Symphony surface in “Beethoven’s Five Secrets.” The haunting “Arwen’s Vigil” is an original creation of van der Beek, Schmidt, and Nelson. Mind-boggling imaginations these guys have! Who cares what they call themselves? The Piano Guys’ successful blend of acoustic and electric sounds appeals across genres and generations (and the first Sony CD is a surprising $9.99). Josh Wright’s piano expertise ranges from classical to pop, and his accolades likewise from winner of an International Chopin Competition to No. 1 on the Billboard charts. The same enticing range appears on his self-titled new album, Josh Wright. It’s actually his fourth but the first to be produced by Shadow Mountain ($16.98), following a couple of successful concert appearances at BYU Women’s Conference. Young Wright took his cue from other successful LDS artists and has managed to skillfully and beautifully blend hymns with classical pieces, although he also lets Chopin, Ravel, and Liszt have their own space on this album. His “Claire de Lune/ How Great thou Art” combo is gentle genius. The talented Sam Cardon orchestrated and/or arranged several pieces Josh plays. You can hear Cardon’s signature sounds in some of the arrangements, including a mix of the adagio movement from Rachmaninoff’s Concerto no. 2 in C minor and “Abide with Me, ‘Tis Eventide.” Josh’s own bluesy arrangement of “Homeward Bound” is dedicated to Cardon, who’s obviously had a major influence on the young pianist. Likewise, Wright’s rendition of Rachmaninoff’s “Rhapsody on a Theme of Paganini” (18th Variation) is dedicated to his University of Utah piano professor, Susan Duehlmeier. No gimmicks here — just a classically trained, highly skilled, and creative pianist giving his all on some old and new classics that appeal to good taste.